Volunteers must be at least 16 years old (some positions require individuals to be at least 18 years of age) and be able to make a commitment of approximately three hours a week for three months at our Harmony Equine Center. Volunteers will assist with mucking, grooming, and grounds work. 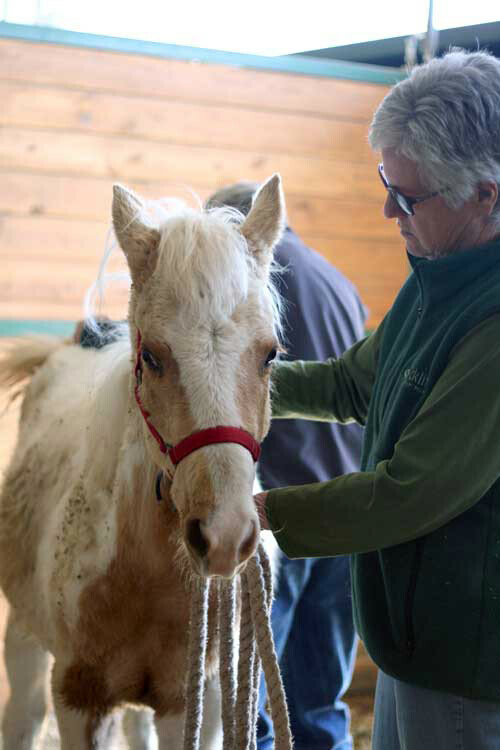 Volunteers do not ride the horses at the Harmony Equine Center. 1. Complete the application - If your availability and interests coincide with available volunteer positions, we'll contact you to schedule you for a volunteer orientation. 2. Attend orientation - Each volunteer attends a two-and-a-half-hour orientation where we provide an overview of our services, philosophies, an introduction to our volunteer program and a tour of the shelter. 3. Interview - Prospective volunteers interview one-on-one with a Dumb Friends League representative to discuss personal goals and determine the most suitable volunteer assignment. 4. Attend training class - To learn about safety procedures, pet adoptions, animal behavior and the League's many programs, volunteers also participate in a hands-on training class. As part of the volunteer application process, there is a $25 volunteer application fee that covers the cost of administrative processing, background check fees and volunteer uniform. Are you available for 3 hours on the same day and time each week for a regular shift? Why are you interested in becoming a DFL volunteer? Proof of medical insurance is required to volunteer. Do you have medical insurance? Are you able to lift 30lbs? Open FRI, SAT, SUN from 11 a.m. to 3 p.m.